The SOCIB Data Policy follows similar open information policies from around the world, IMOS (Australia), Neptune (Canada) and the OOI ocean observatory initiative or IOOS in the US for example. Archiving and disseminating observed and modelled marine data is at the core of the SOCIB mission. Dissemination implies timely, generally free and largely unrestricted access to all data, associated metadata and products generated by ICTS SOCIB. The SOCIB Data Centre Facility (DCF) has the responsibility for implementing the SOCIB data policy. The DCF with its close ties to European and international programmes, is implementing and driving international activities related to multi-platform data integration and visualization. Including the life-cycle management of the data (from observation to archive) and in terms of developing technically innovative ways to handle the large quantities of interrelated datasets that are available through the SOCIB coastal ocean observing and forecasting system. Delivery is achieved through systems and processes for data and information management developed by the Data Centre Facility and through international portals for oceanic observations to which SOCIB contributes (e.g. PERSEUS, MyOcean). In addition some monitoring datasets may be the result of research experiments designed by SOCIB partners that make use of SOCIB facilities. These datasets are also part of the ICTS SOCIB Data Policy. Data products used in this application were obtained from SOCIB (www.socib.es). In addition, please make visible the SOCIB logo. Data used in this work were obtained from SOCIB (www.socib.es). A principle component of SOCIB’s mission is the monitoring and dissemination of observations from the coast and seas around the Balearic Islands. To facilitate this, data collected by SOCIB are presented as images in as close to real-time as possible, near real time (NRT), on the SOCIB website. In general the NRT data will also pass to the electronic data portal for open access to all for download as NetCDF files. It should be noted that in order to provide access to data in NRT mode, only a basic level of automated data quality control can be applied, for example to ensure that the instruments are still operating correctly. In some circumstances there may be a limited delay in the availability of NRT data, for example, where data is critical to specific post-graduate studies, or where data collection has been commercially supported and the organisation that has provided the support requires a period of embargo, or where the data requires considerably more quality control and may only be useful in delayed mode. Following detailed calibration, validation and quality control, the data are made available as delayed mode data from the SOCIB electronic data portal and are also sent to oceanographic portals such as for example SeaDataNet. The delayed mode (DM) data are stored in the SOCIB electronic data portal and are available through the SOCIB website for delivery to the requester as NetCDF files. Following the policy clearly stated in the SOCIB mission, these data are freely available, however as DM data contains significant added value funded by the Spanish and Balearic Islands government grants, there are some exceptions to this policy particularly for external commercial use. This is discussed more fully later under charges and intellectual property. SOCIB actively encourages the timely availability of the DM data, this is usually several months after the initial real-time dissemination in order to allow for the careful calibration, validation and quality control of these important datasets. In exceptional circumstances SOCIB allows researchers to retain exclusive rights to delayed mode data for a predetermined and limited period following archiving, in order to expedite the publication of scientific papers, degree theses and commercial reports. Typically this additional period of delay is not expected to exceed 90 days, but case-by-case flexibility does exist. The SOCIB DCF is also keenly aware of the importance of both model forecasts and the analysis of observational data to assist in the protection and sustainable management of fish stocks, aquaculture and bio-diversity. SOCIB is currently actively seeking to expand its biogeochemical data calibration and validation skill sets so that the delayed mode data have a greater multi-disciplinary coverage. Further use of near real time and delayed mode data come from the interpretation, multidisciplinary combination, development of applications and high level derived analysis of the various data types, such as the solving of fluid dynamic equations, the correlation of biological samples with water properties or the assimilation of real-time observational data into model forecast data sets. Broadly these are termed data products and services. In addition, scientific publications, further degree theses, and commercial reports all generally rely on the products of complex combinations of multi-instrument and often multi-platform data sets. The results of these publications take scientific knowledge and the application of scientific knowledge forward, so that many of these publications will lead to new services for stakeholders to responsibly exploit the Balearic marine environment. The close historical links between SOCIB and the EU MyOcean and MyOcean2 programmes have helped to focus the Data Centre Facility and its data policy around the needs of users. The near real-time open access policy is ideal for search and rescue (SAR) support and up to the minute environmental information for oil spill response teams. Sea-state, forecasts and hindcasts of surface currents, sea surface temperatures data and meteorological analyses are all key factors in predicting surface drifting, and likely survival periods in the case of SAR. These data and forecasts provide the information required to minimise the time spent in response to an emergency, minimise the risk to the response crews, and maximise the probability and scale of success. The data streams, data products and data services, discussed above, from the nationally supported SOCIB infrastructure are currently accessible to all users through the SOCIB website. SOCIB principles of timely, open access, with acknowledgement of the data as sourced from SOCIB will be adhered to wherever possible. Near real-time image data will remain freely available to all, through electronic access tools. Ordinarily, delayed mode data will remain freely available, through electronic access tools, to SOCIB stakeholders, scientists and scientific institutions; where SOCIB stakeholders includes all Spanish and Balearic Islands tax payers. Stakeholders also include those involved in promoting and ensuring maritime safety, those involved in unlocking marine resources for the benefit of the Balearic Islands, those involved in protecting the coastal and marine environment and those providing open access weather, seasonal and/or climate forecasts. Prospective users requesting delayed mode data who are not included in the above descriptions, or users that require a faster track access to calibrated and validated data, may be expected to contribute a fee, or in kind support for the SOCIB infrastructure, to reflect some proportion of the work associated with the added value contained in delayed mode data. Intellectual Property Rights (IPR) associated with SOCIB raw data lie with the SOCIB consortium. Any IPR associated with SOCIB value-added products, produced under the auspices of SOCIB, also lie with the SOCIB consortium. SOCIB will issue an automatic non- exclusive licence to any user of near real time or delayed mode data for downstream IPR, provided the user registers it’s details and interests with the SOCIB data centre facility, a process which will be fully electronic in the future. This allows the IPR of value-added products or services, not produced under the auspices of SOCIB but which use SOCIB data, to rest with the agency that produces that product or service, with no restriction other than that set out below. Any pre-existing IPR at the commencement date of SOCIB is still recognised and respected and data affected by this can only be used as authorised by the owner of the IPR or as permitted under Law. Except where otherwise negotiated with the Office of the Director and agreed by the governing bodies, any users (including re-packaging) of SOCIB data, data products and services are required to clearly and prominently acknowledge the source of the material derived from SOCIB, together with (where relevant) a reference/link to the related metadata record. Re-packagers of SOCIB data should include a statement that information about data quality and lineage is available from the metadata record and a statement that data, products and services from SOCIB are provided “as is” without any warranty as to fitness for a particular purpose. SOCIB’s Terms and Conditions will be available on the Data Facility’s web pages for this purpose. In addition to registering their interests for the purposes of supporting SOCIB’s reporting statistics and demonstration of SOCIB’s socio-economic presence, users downloading data from the SOCIB Data Centre Facility will be explicitly reminded of their ethical obligation to contact SOCIB prior to publication, and offer acknowledgement and/or co-authorship, where appropriate. Any person or institution downloading data from the SOCIB web site will accept the present Terms and Conditions. These Terms and Conditions will encompass the SOCIB Intellectual Property Rights, Use and Dissemination of Data Rules, and the SOCIB Data Policy, and will follow established examples such the MONGOOS Agreement, which covers the exchange of oceanographic and modelling data in the Mediterranean, to which SOCIB is a signatory and/or other similar agreements currently under development, such the PERSEUS IPR and data policy. The SOCIB data policy supports the SOCIB mission in coastal and marine monitoring. It both promotes and seeks to lead in the continued development of the EU’s Marine Strategy Framework Directive. The open access policy implemented by the Data Centre Facility provides monitoring data for use in environmental impact assessment (EIA) studies both to provide a baseline assessment and post development monitoring for new developments. For legacy developments, SOCIB’s monitoring data provide a basis for trend analyses and advanced warning to support timely mitigation intervention. 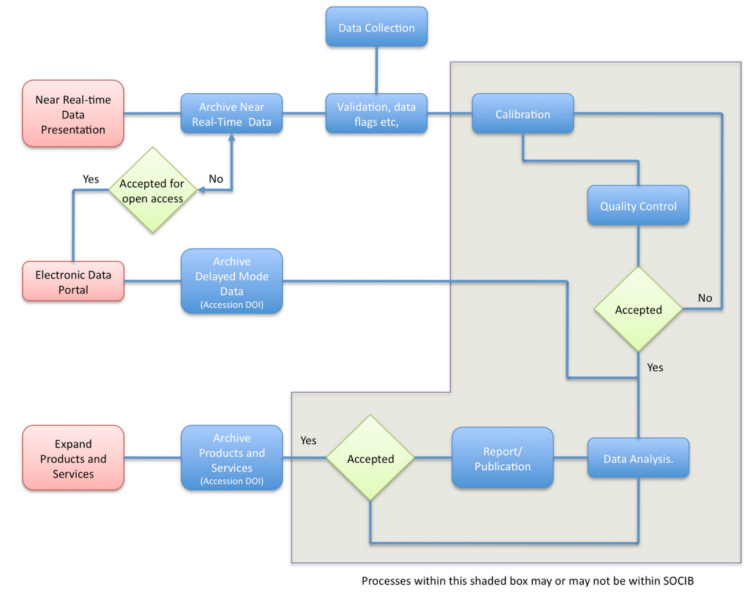 The life-cycle data approach of the SOCIB data policy recognizes the importance of good practice in long-term data archiving for reanalysis products of the future. As scientific marine forecasting skill grows, so too will the requirement to re-examine historical observations and model analyses.